For eight years, HBO’s hit series, Game of Thrones, has dominated cable television and ran rabid amongst pop culture media. The series is filled to the brim with harrowing moments of violence, political turmoil, and of course ferocious dragons, but nothing is more defining to the series than the duels between its characters. The fights in Game of Thrones often signify a turning point in the season, the conclusion of an epic battle, or outright character growth. Below are the ten best duels across season one through seven, representing the best of the action for which the show is known. Ned Stark (Sean Bean), has been accused of kidnapping Lord Tyrion (Peter Dinklage) and is confronted by Jaime Lannister (Nikolaj Coster-Waldau) along with a squadron of King’s Landing soldiers. When the two egos clash, a bloody battle erupts. Ned Stark vs. Jaime Lannister taught us an early lesson when it comes to Games of Thrones, chivalry is dead. In what was supposed to be an epic battle between two legendary swordsmen, ends in anticlimactic fashion, once a soldier intervenes. Had the duel finished uninterrupted, it would have easier had a higher place, but unfortunately, it is placed at number ten due to the banter, and the tease of a great fight. Note, watching Sean Bean swing a sword around is a great callback to his role as Boromir from Lord of the Rings. The duels of season one taught is that being honorable will get you killed, and no better duel teaches us that than the sellsword Bronn hired by Lord Tyrion(Jerome Flynn) vs. Ser Vardis Egan (Brendan McCormack) Knight of the Vale. Their battle is intense, as both duelist fight around a giant opening, that can quickly plummet them to their death. This duel symbolically represents how there is no room for honor in Game of Thrones and serves as the first trial of combat in the series. There is only one duel on this list between a man, and a mythical being, and for damn good reason. White walkers are supposed to be unstoppable forces of pure evil, with only a few weaknesses. The duel is a frantic battle of survival as Jon Snow (Kit Harington) does everything he can to escape the white walker and the enclosing horde. What puts this at number seven is the cinematography of the harsh snowy landscape, numerous skirmishes taking place around their duel, and the discovery of a new weapon against the white walkers. Jaime Lannister vs. Brienne of Tarth ( Gwendoline Christie) is the greatest testament to Jaime’s swordsmanship and cunningness. Escorted by Brienne of Tarth, the legendary swordsman has been walking for miles underfed, tired, and shackled but as soon as he steals Brienne’s sword, an intense aura of danger surrounds him. As if Jaime was brought back to life, by holding a sword. If a Jaime in this condition can put Brienne of Tarth, one of the best fighters in all of Westeros in a corner, then imagine if he was in prime condition. The Battle of the Bastards holds some of the most memorable action scenes of Game of Thrones that concludes with a duel between Jon Snow and Ramsay Bolton (Iwan Rheon). Everything is at stake as this duel not only decides who is king of the North but serves as the Stark families justice against the Bolton’s family treacherous betrayal and crimes. The brevity of the duel keeps it out of the top five duels of Game of Thrones, but good lord is the ending one of the most satisfying ends for a television series villain this decade. Duel number five is unique amongst the other duels on this list, but not because it doesn’t take place in Westeros. For you see, to put it bluntly, Khal Drago (Jason Momoa) is a badass of epic proportions. He is one of the few swordsmen to give an epic speech while walking directly into the blade of the man who insulted him barehanded. Afterward, he ends the fight in a way that would make Mortal Kombat blush. This duel proves that Khal Drago is worthy of being called one of the best fighters in the series. There is a time and a place for fan service, which leads to our next duel on the list. What if a master assassin and a master swordsman squared off against each other in open combat? It is a scene that shouldn’t work, but as soon as Arya Stark (Maisie Willaims) best Brienne in the first exchange of swords, a wide grin spreads across one’s face. The duel is chronologically the last duel on this list and serves as a culmination of experiences between two lead characters who have gone through hell and back. If you haven’t noticed already, Brienne has dominated the list with two previous duels, but her third duel on the list in both appearance and ranking is the greatest of the three. The Hound (Rory McCann), known for his strength, size, and unforgiving swordsmanship finally meets his match against Brienne of Tarth. Whether it be sword or fist, these swordsmen are nigh equal in prowess. Wrestling, biting, and punching barely describes what can only be considered a battle of dominance between two wild beasts. One of the greatest myths of current Westeros and something that has been hinted at for several seasons is how a young Ned Stark bested Sir Arthur Dayne (Luke Roberts), Sword of the Morning, and most skilled of the Kingsguard in single-handed combat. Fortunately the battle of Tower of Joy, and the climactic duel between the swordsmen lives up to its grandeur. What makes this duel one of the best, is how Sir Arthur Dayne lives up the legends around him, and how only the victors write history. 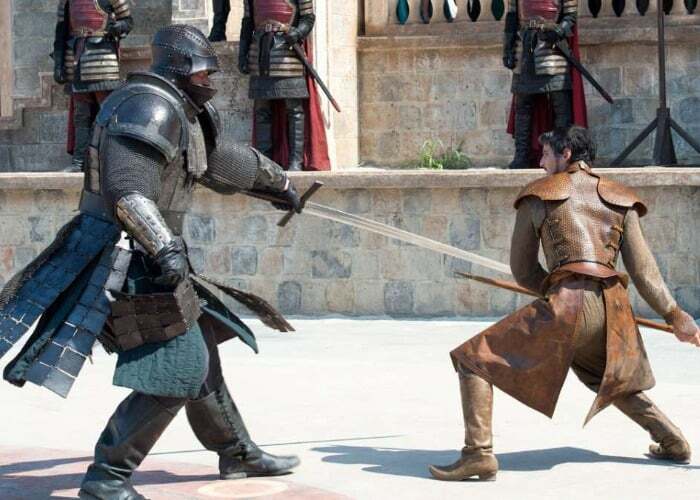 The best duel on the list, and easily one of the most iconic moments of Game of Thrones consist of one entire episode titled: The Mountain vs. The Viper. Oberyn Martell (Pedro Pascal) seeking vengeance against the Lannisters chooses to make an example out of their greatest champion, The Mountain (Hafþór Júlíus Björnsson). For those who don’t know, The Mountain, is the older brother, of the Hound, and yes he is bigger, stronger, and meaner in every way possible. Oberyn knows just one misstep could be fatal yet he dances circles around his larger opponent, all while chanting “Say it. You raped her. You murdered her. You killed her children. You raped her! You murdered her! You killed her children!” The duel concludes with a brutal jaw-dropping moment, that has yet to be matched by any other contest.